We supply and install only the best quality products on the market today, which include; Pyronix, of which we are a registered installer, Texecom, also a registered installer, Scantronic, Honeywell and ADE just to name a few. Our extensive range includes both wired and wireless technology. 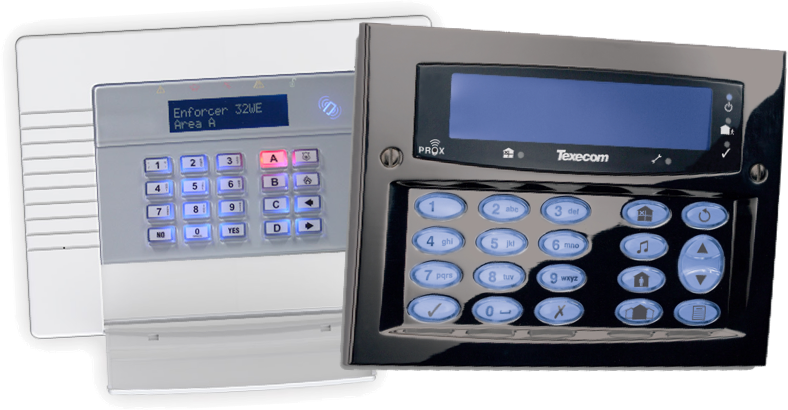 The alarm systems can be monitored either by a central station (24/7, at a monthly fee) or we can install a GSM auto dialer. This is a device which will enable your existing system to call or text up to 30 numbers when your alarm is triggered. New installations are covered by a full 12 month guarantee and providing the system is then annually maintained by ourselves, we will continue to guarantee the system. Access to Pyronix Cloud is also now available via Bedford Security. (Receive updates and control your system via a smart device - Pyronix products only). Pyronix Cloud allows you to connect your Security System and Cameras (See our CCTV page) through highly secure encryption. Many of our systems are now compatible with a wide range of carbon monoxide and smoke/fire alarms meaning your home is ready to alert you in the unfortunate case of a fire or a carbon monoxide leak. Contact us today for a free quotation. So good we had to mention it twice! As stated above, all of our new installations are covered by a full 12 month guarantee and providing the system is then annually maintained by ourselves, we will continue to guarantee the system.